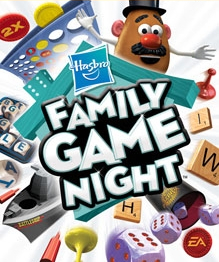 Hasbro Family Game Night was delisted from Xbox Live Arcade between January 10th and October 10th, 2014. It was presumably delisted from the PlayStation Store for PlayStation 3 around the same time. Electronic Arts held the Hasbro license from 2007 to 2014 and released several games based on their board games on numerous platforms. Ubisoft announced in August of 2014 that it was the new license holder for Hasbro properties resulting in the delisting of this and most other EA published titles. Hasbro Family Game Night remains available on physical media for the Nintendo DS, PlayStation 2, Xbox 360 and Nintendo Wii where it was also released in a combo pack with Family Game Night 2. • Join your host Mr. Potato Head as you play games such as SCRABBLE, CONNECT FOUR, BATTLESHIP, YAHTZEE, BOGGLE, SORRY! and SORRY! Sliders. • Experience new ways to play these best-selling board games. • Show off your skills with Hasbro Family Game Night achievements and compete with your friends to earn a spot atop the Xbox LIVE leader boards. • Increase your game score and talk while you play online with voice chat. • Get your Xbox avatar into the game with Hasbro Family Game Night’s avatar support. • Play locally with friends and family or take on other Xbox LIVE players in online play. • Play with up to four players in SCRABBLE, YAHTZEE, BOGGLE, SORRY! and SORRY! Sliders. • Play up to two players in CONNECT FOUR and BATTLESHIP. • Launch new games within the Hasbro Family Game Night destination on Xbox LIVE without leaving your game room. • Download new themes and game room furniture to design and customize your perfect game room. • Show your custom game room to your friends when you invite them over to play! • Each game has a party mode featuring fun new ways to challenge your competitors.